3D Printing - Grades 5-8 - This class is a combination of Engineering and 3D printing where campers will make real working tools, toys, and gadgets. They will learn how to design 3D objects with software and try to build gizmos and gadgets (via 3d printing) using the same engineering process that professionals use to create all the products you use today. This program teaches students many useful problem-solving techniques, develops their knowledge of math & science, and many other critical skills, all in one fun class. All materials included, campers will take home their creations. Gr. 5-8, $255. Weeks 1, 5, 7. Art 101: Drawing, Painting, & Collage - This course explores the making of an artistic composition with a focus on several media- painting, drawing, and collage. Students will work with a variety of materials including charcoal, pastel, ink, watercolor, and acrylic. Subjects will include still life, landscape, and the figure. We will cover the fundamentals of working both 2 and 3 dimensionally including line, shape, value, gesture, perspective, volume, composition, and space with an emphasis on color as the primary force in creating an image. Discover your inner Picasso and create your next masterpiece! Gr. 1-4, $240. Weeks 2, 4, 5, 7, 8. New Art Adventure - Explore color, form, texture, line & shape through various media. Students are given opportunities for self-expression. Lessons aren’t “cookie cutter” projects where every student makes an identical product. Instead, students are encouraged to think about their ideas and express themselves uniquely through their arts. Gr. 5-8, Week 2, $240. Athletic All-stars - Do you love sports? Do you love all sports, both indoors and outdoors? If so, then Athletic All-stars is for you! Each day for a week, students will focus on one new sport. This means in one week campers will experience 5 different sports!!! We will teach the basics and fundamentals of the sport including rules, regulations, safety, basic skills, and proper play. The 2nd half of the session will afford campers the opportunity to play in game like situations including scrimmages, drills, and other events. The camp's goals are fun, exposure to a variety of sports, fair play, and competition. Sports possibly offered during the week may include, Football, Basketball, Floor Hockey, Baseball/Softball, Lacrosse, Track and Field, Soccer, Volleyball, and Field Hockey. Gr. 1-4, $240. Weeks 2,5,7. Blackrocket Battle Royale: Make Your First Fortnite® Style Video Game - Fans of Fortnite we need you! Instead of playing the game, design your own. Using a professional 3D game development software, build levels and assets inspired by popular battle royale games like Fortnite. This course includes cartoonish action and battle sequences. Student-created games will be available on a password protected Black Rocket website to share with friends and family. Students will work in pairs or teams for most of the program. Gr. 3-6 Morning, Week 8. Gr. 6-8 Afternoon, Week 8. Comic Book Illustration - Welcome to the exciting world of comic book art! Students will learn techniques that will add a professional touch to today's most popular comic books. We'll explore the principles of composition and narration through a series of fun exercises. Finished projects will include a character design, an illustrated story and a full-page illustration. Previous drawing experience is not required. Gr. 5-8, $240 - Weeks 5 & 7. Competitive Edge Hockey: Boys & Girls - To register for hockey, visit the Competitive Edge website. Discounts are available, please visit the Competitive Edge website. For more information, please visit the Competitive Edge website, or call Scott Bertoli: (609) 306-2621. New Competitive Edge Camps is proud to announce the addition of our Field Hockey & Lacrosse summer camp! The camp is led by USA Field Hockey Level II certified and current Princeton Day School varsity field hockey coach, Heather Farlow, and US Lacrosse Level I certified and current Princeton Day School girls’ lacrosse coach, Emily Shircliff. Competitive Edge Field Hockey & Lacrosse camp provides detailed instruction, with skill development and competitive play for all levels of experience. Players, in grades 1 through 6, will participate in a variety of activities to help develop and strengthen ball handling skills, fitness, knowledge of the rules, game strategy and more. Every day will be devoted to sport specific instruction for both sports. We will alternate morning and afternoon sessions for field hockey and lacrosse. Players will be divided by both age and experience level to ensure that every participant has a positive experience. All athletes need FH/LAX goggles, a mouthguard and shinguards. To register, visit the Competitive Edge website. Crafting Craze – This week will involve running around and creating natural and ‘traditional’ crafts using collected material like sticks, leaves, rocks, and of course mud! We will create many natural crafts using material the campers gather themselves. While the sun dries handmade paper and candles cool off we’ll play games and run around. Rest assured these campers will have plenty of fun crafts to show off! Gr. 1-4, $240. Weeks 2,4,8. New Cursive Writing - Would you like your child to learn cursive writing? Studies have shown that writing in cursive is beneficial in many ways, for example, one study concluded that improved handwriting skills benefits cognitive development and motor skills and can lead to improved writing skills and reading comprehension. Campers will review letters, words and sentences. When students learned cursive writing they were excited to find that they could write entire words without lifting their pencil from the paper. Gr. 3-4, $240. Weeks 2,6,7. Daily Dose of Dinosaurs - Journey into the world of dinosaurs. Each day you will learn about a different dinosaur, play games, and build a dinosaur replica. Friday there will be an archaeological dig. Gr. PK4-K. Weeks 5,8. Debate – Campers will learn how to construct and deliver effective oral arguments. They will frequently engage in lively, structured debates with one another. Time and attention will be devoted to researching the debate topics in order to back up claims with facts, and campers will be taught proper public speaking methods. This program will stress public speaking delivery, organizational skills, quick thinking, awareness of issues and knowledge of current events. Gr. 5-8, $240. Week 5,6,8. Digital Photography - Shoot photos, not snapshots. In this course, campers will use school cameras to take pictures under varied conditions, and discover ways to edit photos, improve color, contrast and sharpness. They will vary depth of field, shooting angles as well as effective lighting, as they learn to think about photo-composition before pressing the shoot button. After shooting they’ll practice an effective workflow, as well as tips about caring for cameras, memory cards, card readers and safe saving. They’ll create slideshows and photo books. On the last day, they will bring home all the photos they took, all the books created and all the pictures taken by them. Gr. 4-6, $240. Weeks 3 & 8. Driver's Education, Classroom & Behind-The-Wheel - A State-Approved Driver's Education course, This one-week program consists of 30 hours of classroom instruction and six hours of Behind the Wheel Driving experience. The State written test is administered at the conclusion of classes. In order to be eligible to take the state written test, the student must be at least 16 years of age; however, for those not yet 16 at the time of classroom instruction, parents should contact East Coast Driving School to schedule one of their instructors to bring the student to NJMVC to take the written test upon their 16th birthday. The appropriate time to take this course is if the student is 16 or will turn 16 in the 2018-2019 school year. Attendance at all 30 hours of class is mandatory to receive certification. Drone Racing & Obstacle Course Challenge - Drone Racing is filled with pure action as students enjoy one of the world’s fastest growing sports, Drone Racing. Campers will first learn about the basic safety of drone flying and the history behind drone racing as a sport. From there, campers will progress through various skill challenges and learn how to perform various exercises and maneuvers to become familiar with the drone’s speed and agility. Flight squads post up against one another in friendly competition when they race themselves and the clock. Students first maneuver the drone through creative obstacle courses before taking on the challenge of flying for speed. Fishing: Catch of the Day - Learn everything you need to know about the basics of fishing. Campers are introduced to various fishing terminology and techniques, where and when to fish, how to choose a rod and reel, baits, tying knots, lures, hooks and other fishing tackle. They will practice what they learn with games, casting target practice, and fishing in the ponds of PDS. Camp will also include two trips to local fishing hot spots. Please bring water shoes and/or extra pair of sneakers. Gr. 1-4, $240. Weeks 2,3,5,7. Flag Football - This program is a terrific way to introduce campers to the safe, contact free sport of flag football. We also welcome experienced players who hope to “sharpen their skills”. Campers will be instructed on skills and drills to play successfully on both sides of the ball including passing, catching, and de-flagging or defensive positioning. See you on the gridiron! Gr. 3-5, $255. Weeks 3,5. Freestyle and Basic Ice Skating - Princeton Day School Summer Programs has teamed up with Learn to Skate USA to offer skill levels 1-8. Six progressive levels introduce forward and backward skating, stops, edges, crossovers, and turns. Upon completion of the Skills 1-6 levels, skaters will be able to confidently advance to more specialized areas of skating. All classes will be well-structured with the focus on proper skill development, taught in a positive, FUN, and social environment. Skaters will progress at their own rate and advance after skill mastery is demonstrated. Basic 1 and 2: These introductory levels allow new skaters with no prior skating experience to build confidence while learning the fundamentals. Basic 3–6: These levels develop all of the fundamental skating skills on the ice. Focus is on learning the ABCs of basic athleticism: agility, balance, coordination and speed. Journalism – Be part of a real-life journalism and media experience with this hands-on, interactive, and fun workshop. Armed with curiosity, and a reporter’s notebook, we will make our own blog, The PDS Summer Times. Along the way we’ll learn what journalism is, and how to get the best story. We will interview fellow campers and staff, and practice writing skills and tricks to really grab the reader. What is news? What makes a good story? We will practice writing compelling news stories, including how to think like a reporter, ask key questions during interviews, and gather information from credible sources. We will also explore how to write a powerful opening sentence, and craft eye-catching headlines. From brainstorming ideas to the polished piece, campers will be given assistance every step of the way including suggestions for voice, choice of language, structure, use of quotes, and editing. Gr. 5-8, $240. Weeks 5,6. Knitting Handmade, Home-Made - Come and learn to knit and purl! Together we will enjoy learning a new craft while playing with color and yarn! Children will choose from an array of small projects they can finish and take home at the end of the week. Knights & Princesses - Calling all royal knights and princesses! In this exciting camp children will listen to the old favorite tales of royalty, play language arts games to enhance early reading skills and make special royal crafts to bring home. Children are encouraged to wear their royal garments to camp, but frogs must be left at home! Gr. K-1, $240. Weeks 5,7. Lady Panthers Basketball Camp - The camp is led by Princeton Day School Girls' varsity basketball coach Liz Sharlow. This basketball camp is an opportunity for female youth basketball players to develop their skills, familiarize themselves with the game, play competitively, and gain confidence in their abilities. We aim to provide top notch instruction, and make sure to have as much fun as possible! Gr. 3-8, Week 2, Full Day. New Natural Arts - Students will learn how to incorporate the natural world into their artistic creations. They will explore a variety of artistic media such as printmaking with plants, foundational watercolor skills, stencils making, and collage. Students will explore the garden and grounds of PDS to make nature-based art projects such as earth looms, candles, and more. Gr. 1-4, Wk 3, 6. New Natural Art Expression - Students will explore the canvas of the natural world, crafting artistic expressions from nature and the art studio. Students will create art from upcycled materials, demonstrating the beauty of recreation through artistic expression. They will learn printmaking, weaving, and collage, harvesting their materials from the meadows and gardens of PDS. Students will explore the garden and grounds of PDS to make nature-based art projects such as earth looms, candles, and more. Gr. 5-8, Wk 3,6. Painting and Poetry - Summer is such a splendid time of year and what better way to honor it with art and writing. In this creative course we will explore the sounds and rhythms of poetry. We will compose poetry and express our visions through beautiful whimsical paintings. Our mediums will be acrylic paint and water colors. Come relax and express yourself in this beautiful time of year. Pre Algebra - This course is designed as a brief introduction to terms and expressions used in a middle or high school pre-algebra class. Students will have an exposure to new types of numbers such as integers, fractions, decimals and negative numbers, factorization of natural numbers, properties of operations, and other math terms in an enjoyable and low pressured classroom setting. Gr. 7-9, $240. Week 7 Morning. New PDS Science Adventure - Campers will be introduced to different areas of science in each class. They will learn the basic principles and do fun and safe hands-on experiments. This program fulfills today's need for STEM education for young minds. They will enjoy experimenting and exploring cool topics every day like making volcanoes, building bridges, circuits etc. All experiments are safe and age appropriate, kids will take home their design and end product. Gr. 2-5. Weeks 2,3,4,6,8. Simulate the Golden Age of Greece - This simulation is designed to “gamify” an educational experience about the classical Greek world. Rather than being presented historical information about the topic, participants experience and discover the history for themselves, as though they were living through it - feeling the ups and downs of being in control of a city-state’s destiny. You’ll begin by creating a fictional city-state and placing it among the Aegean Sea, connecting it to other cities through trade routes and common mythology, and deciding on an overall philosophy for your people to follow. Will your city-state focus on craft, strength, or wisdom? Over the course of “turns” that act like years, this city-state will grow and evolve, based on luck and careful decision making. You’ll be at the mercy of “the fates” - pulling cards each turn that indicate positive or negative events that affect your people. You will also have to trade, battle, create works of art, collect “Great People” of different types, and constantly be on the lookout for opportunities to grow your assets. The Panhellenic Games, the Athenian Schools, and large-scale invasions of Persians are some of these opportunities, to name a few. The simulation’s activities involve numerous disciplines, including but not limited to: mathematics and geometry, science and technical design, artistry, social/emotional learning, physical education, presentation and oratory, writing, and even food tasting! It is not necessary for participants to have any existing knowledge of ancient Greece in order to thrive - just a love of gaming! Full day, Gr. 4-7. Wk 3. Soccer – We welcome students of all abilities to our soccer program to enjoy “the beautiful game”. This program is coed, and will focus on fundamentals such as foot skills and ball mastery, tactical shooting, teamwork and most importantly, fun. See you on the pitch! Gr. 1-4, Weeks 2,4,6 and Gr. 5-8, Weeks 4,8 $255. Painting and Poetry - Summer is such a splendid time of year and what better way to honor it with art and writing. In this creative course we will explore the sounds and rhythms of poetry. We will compose poetry and express our visions through beautiful whimsical paintings. Our mediums will be acrylic paint and water colors. Come relax and express yourself in this beautiful time of year. Week 5, Afternoon. - The camp is led by Princeton Day School Girls' varsity basketball coach Liz Sharlow. This basketball camp is an opportunity for female youth basketball players to develop their skills, familiarize themselves with the game, play competitively, and gain confidence in their abilities. We aim to provide top notch instruction, and make sure to have as much fun as possible! Gr. 3-8, $470. Week 2 Full Day. Pre-Algebra - This course is designed as a brief introduction to terms and expressions used in a middle or high school pre-algebra class. Students will have an exposure to new types of numbers such as integers, fractions, decimals and negative numbers, factorization of natural numbers, properties of operations, and other math terms in an enjoyable and low pressured classroom setting. Suitable for grades 7-9, $240. Week 7 Morning. Read more ... about Just Added! 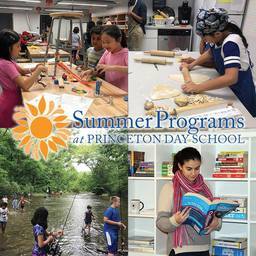 Registration is now open for Summer Programs at PDS! Be sure to check out several exciting new opportunities this summer: Art Adventure, Competitive Edge Field Hockey & Lacrosse, Creative Writing, Cursive Writing, Hand Made / Home Made Knitting, Natural Arts, Natural Art Expression, Science Explorers, and Songwriting Workshop. Read more ... about New for Summer 2019!